OMEGA 90° Offset Style Collar Removal Tools may be driven directly with a standard hand ratchet or fitted to an extension for deeper access. If you come across a challenging application, our experienced staff will be more than pleased to work with you and make a tool recommendation. The OMEGA REM102-8 90 Degree Collar Removal Tool For Hi-Lok and Hi-Lite, 1/4'' Square Drive is one of thousands of quality tooling products available from MRO Tools. Please browse 90 Degree Offset Style Collar Removal Tools for tools similar to the OMEGA REM102-8 90 Degree Collar Removal Tool For Hi-Lok and Hi-Lite, 1/4'' Square Drive. OMEGA REM102-8 90 Degree Collar Removal Tool For Hi-Lok and Hi-Lite, 1/4'' Square Drive description summary: OMEGA 90° Offset Style collar removal tool allows for removal of nuts located in restricted areas. 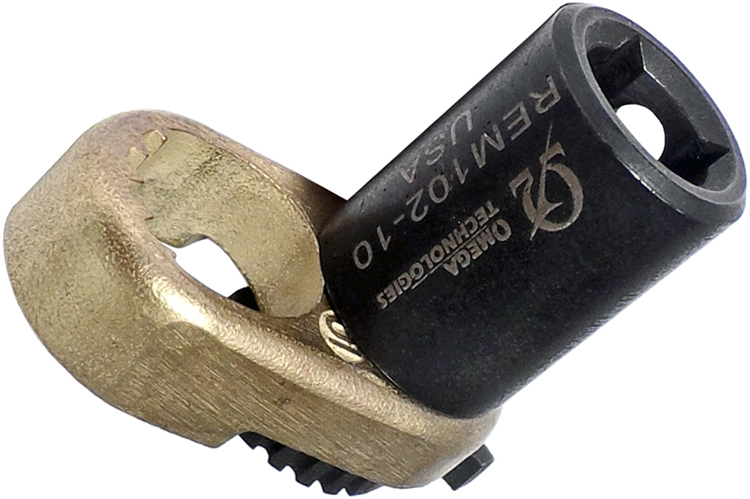 Square Drive: 1/4'' Width: 0.67 Height: 0.35 Length: 1.19 Quantity discounts may be available for the OMEGA REM102-8 90 Degree Collar Removal Tool For Hi-Lok and Hi-Lite, 1/4'' Square Drive. Please contact MRO Tools for details.